Is it snowing in Kirkwood ?¡Gracias! With a base elevation of 7,800 feet, Kirkwood is the highest starting point of any major resort in Lake Tahoe. Kirkwood catches the best snowstorms coming its way. There are 2,300 acres for skiing and riding and a new quad called the Cornice Express. 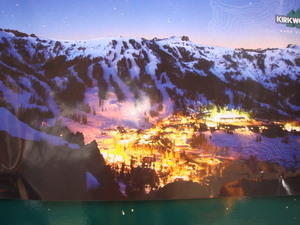 Kirkwood has 110 condos within walking distance and 20,000 rooms at S. Lake Tahoe (studios through to 3-bedroom units.) No camper facilities. 1. It is phenomenally good value. Spring pass was 99 bucks. 2. Lots of the terrain is terrifying. Kirkwood is the place to sharpen you ski skills and learn to jump if you think you're an advanced skier. There are 100s of jumps ranging from Hollywood Hip, a rollover under lift 6 which pretty much any decent skier could hit, to Hospital, a 100 ft cliff drop that gets hit by a couple of maniacs per year on a big powder day. Most people should be able to find a few jumps of their level. 3. There is virtually zero apres-ski. 4. It's a short mountain.